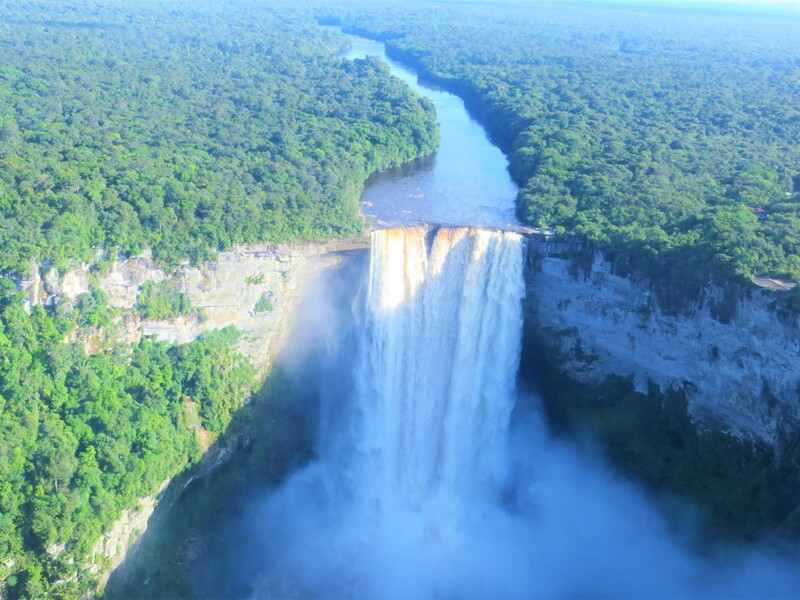 I saw a picture of the Kaieteur Falls in my Social Studies text when I was about six years old. The image captured my imagination, as did the accompanying text which trumpeted Kaieteur’s status as one of the wonders of the world. My fertile imagination immediately took me far away from the usual bedlam of my second year primary school class, and into a lush magical green and brown world in which Tarzan and his jungle friends cavorted and luxuriated. 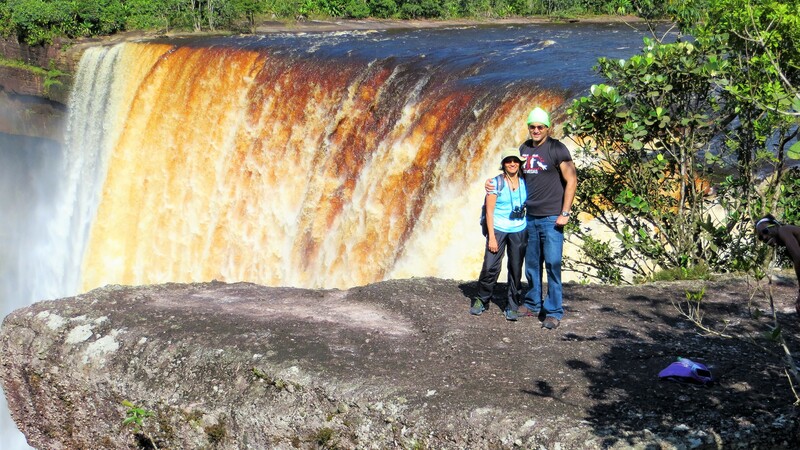 In the ensuing years, I visited and admired the Niagara Falls, as well as Trinidad and Tobago’s own Maracas waterfall and the falls at Blue Basin. Kaieteur, however, remained tantalizingly elusive, until a trip to Guyana in 2015 changed that. On a hot sunny day with azure skies beckoning overhead I boarded a 12 seater single engine Piper Caravan aircraft at Ogles airstrip. The tiny cabin and absurdly low roof grudgingly allowed me passage to my seat only after careful manoeuvring and bending almost double. The cabin was soon packed with travellers and I wondered, absurdly, whether the tiny aircraft had the means to lift us all off the ground! Despite my misgivings, the Piper, after a startlingly short take off run, soared effortlessly into the sky. As we climbed and then levelled off, I was captivated by the slowly unfolding forest greenery criss-crossed by shining brown waterways which casually writhed to and fro thousands of feet below us. From our height the trees, which reminded me of broccoli florets, formed an almost unbroken carpet. Yet here and there, the effects of mining presented a most unsightly and tragic scarring of the rainforest. At times during the hour long flight, I morbidly speculated as to our probable fate should our little aircraft lose power and be forced to set down in that jungle below. Perhaps we would be eaten alive by a jaguar or a giant anaconda or even carnivorous insects! I hurriedly dispelled these thoughts by reassuring myself that Air Services Ltd., which operated our aircraft, had a hitherto excellent safety record. 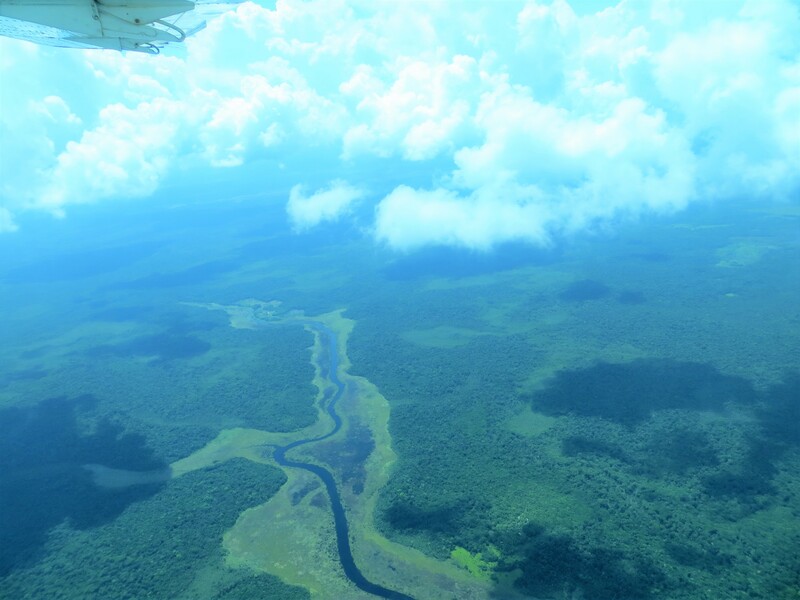 Suddenly, our pilot announced that we were approaching the airstrip at Kaieteur and he banked his right wing low below the horizon. It was then when peering through my tiny cabin window that the Kaieteur falls were revealed to me. 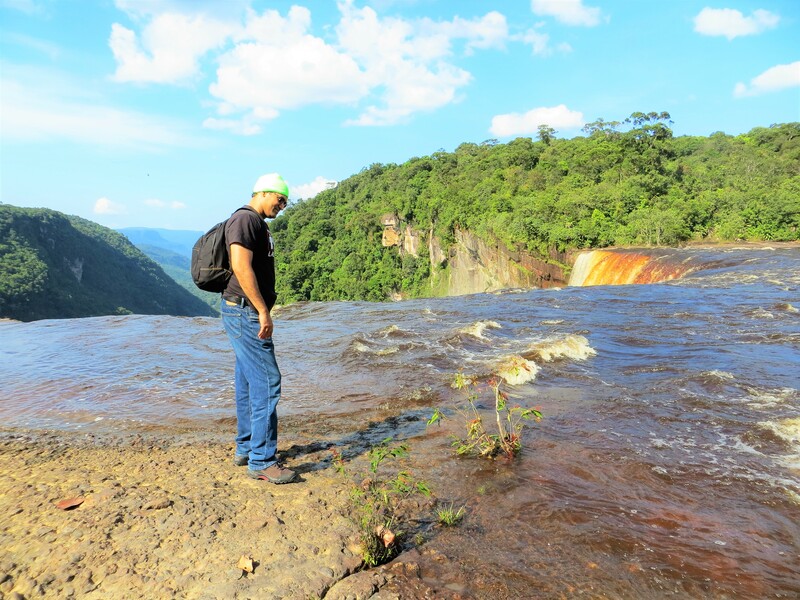 The falls actually begin when the sinuous Potaro River, richly hued in rusty brown, meets the edge of a precipitous drop. An enormous volume of water then cascades majestically down until it terminates in a roaring, foaming mass at the base. I was certain that our aircraft tilted even further when persons on the opposite side of the cabin strained over to catch an aerial glimpse of the monster. To my immense relief, their action did not seem to unduly interfere with our stability, and in just minutes we had landed safely on the tiny airstrip at the Kaieteur National Park. A short but hot and humid trek with our Amerindian guide led us along a rocky path, which allowed us to traverse some reddish rock formations, estimated, much to my amazement, to be over a billion years old. 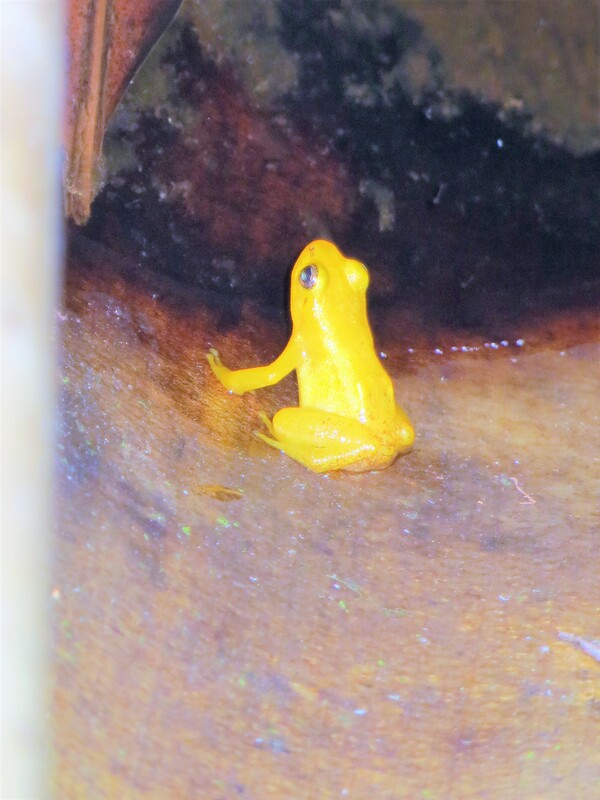 We also stopped and peered into a large pitcher shaped plant where a beautiful miniscule golden frog, not much larger than a finger nail, crouched imperturbably. Our guide finally led us to three separate look-out points, each of which provided an increasingly spectacular vista of the falls. The final look-out point was for me the most special one. My view from one rocky bank allowed me to appreciate the expansive spread of the river as it flowed between banks which were copiously adorned with trees and undergrowth. At the edge of the river-bank I was able to dip a hand into the chilly Potaro. I felt its currents and eddies as it flowed relentlessly over smooth rocks and silt like soil towards the edge of the falls, less than one hundred metres away from me. From this vantage point I was also able to notice a splendorous rainbow which wreathed the voluminous mist and spray at the base of the cataract. 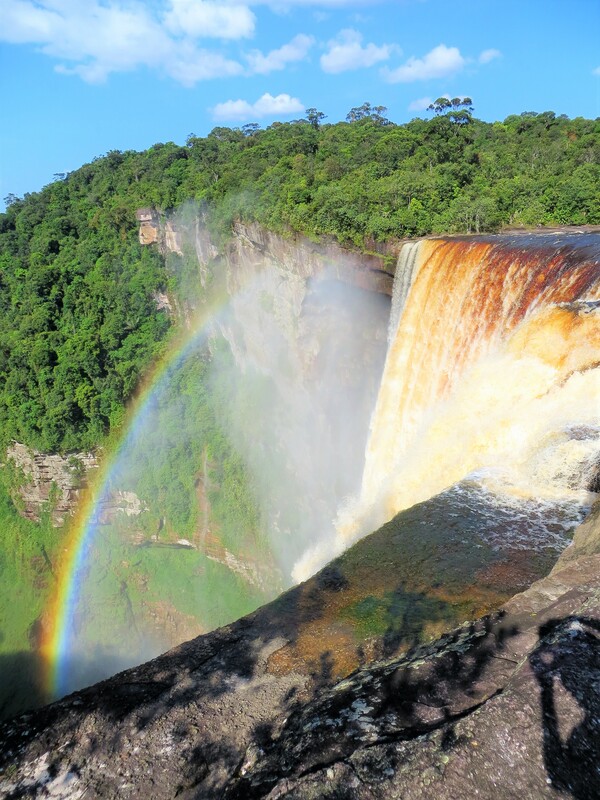 It was while peering uneasily over the edge of the precipice encircling the falls that I recalled the legend of Kaieteur, which told of old man Kai’s horrifying plunge over the edge of the falls, only to find salvation and immortality through Makonaima’s (“the Great Spirit”) beneficence. I, however, was not emboldened by the tale of Kai’s salvation and kept a safe distance from the cliff’s edge. I certainly did not wish to find out whether Makonaima was similarly disposed to assist me in the event of a tragic misstep. All told, my stay at the falls lasted about two hours, yet the time spent there seemed all too fleeting when I heard that it was time to leave. Back at the airstrip we all boarded the Piper which then proceeded to once again defy the odds and lift off into the afternoon skies. I wistfully thought at the time that I was to be left with merely my memories, and photos. Our pilot had different intentions, however, and within seconds of take-off he executed a low sweeping turn which allowed everyone a farewell grandstand view of the falls, not to mention a final chance to take a few hurried snapshots! So at last I had visited the fabled Kaieteur Falls, most aptly described as a wonder of the world. On a personal note, the visit also allowed me to cross off yet another item from a lengthy bucket list. The Guyanese people are truly fortunate to live in a country so rich in natural beauty. I count myself fortunate to have had the opportunity to share in their wealth.